There’s been quite a bit of talk about automation recently, and its impact on the future of jobs. You can see the effects all around you readily enough: automated check-outs at supermarkets, automated check-in at airports. These were jobs once done by people; now they’re done by machines. It’s not just the low-level, low-paid jobs that are being taken over by machines and robots, such as factory assembly, call-centre work and warehouse stock-picking: technology is also edging into the legal profession and medicine. Free internet services can do instantaneous translations, and programmers are busy developing software to compose music, create art, write novels even. In fact, this article has been written by a computer. Just joking. But it is perhaps no joking matter when the Governor of the Bank of England, Mark Carney, expresses his concern. The usual riposte to worries about the effect of automation on the job market is that advancing technology brings with it new and unimagined opportunities, and that employment adapts and catches up. The Luddites needn’t have worried about the long-term impact of mechanisation on manufacturing back in the early 19th century – and nor should we. But is the pace and scale of change different now? Is the world of work really about to be utterly transformed? This is a big intergenerational question: it could seriously affect the prospects of younger generations already living, let alone our legacy to generations yet unborn. The problem is not so much automation itself, or indeed the potential devastation of the job market. There are millions of time-serving, dead-end jobs around that bring no pleasure or satisfaction to those who perform them. No great loss there – apart from the vital sustenance of the pay packet. Robots will still make the goods we need, but how does the profit from such enterprises get distributed? At present, “disruptor” technologies appear to bring huge rewards to their creators and an élite at the top, and to crush those engaged at the coalface with low pay and unstable work – or redundancy. In other words, they seem to increase inequality. They certainly do not compensate the victims of this advance in technology. The capitalist system is simply not set up to operate in this way. An alternative solution might be the introduction of a Universal Basic Income, which would hand out a regular sum to everybody – rather as the state pension currently pays an income to (and only to) everyone in that particular age bracket. 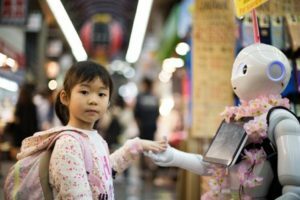 A futuristic vision of a Universal Basic Income might be one of fully automated factories merrily churning out the goods that we need, while everyone has enough to live on, whether working or just pursuing their own quests for fulfilment – in pastimes and hobbies, sport, art, learning, travel, watching TV, or whatever they fancy. Clearly we need to think about this future, and think about how we should get structures in place to steer us – and future generations – in the direction of utopia, rather than drift carelessly into a dystopia. Ever seen Blade Runner?